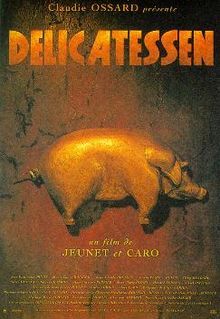 This month's movie choice for Food 'n' Flix is Delicatessen, a 1991 French film. It wasn't at all what I was expecting - from the name I pictured something like a cross between Chocolat and Amelie. I couldn't have been further from the truth. Delicatessen is set in an apartment building in some sort of post-apocalyptic France. You never know what has happened, or what year it is, but there is clearly a shortage of food and everyone is starving. Every so often, we learn, a new tenant arrives to live in the apartment building - but they don't last long. The butcher, Clapet, kills them and serves them up to the other residents. It's more a black comedy than a horror film and you never see anything particularly gory. The film is also a love story between the newest tenant to move into the building (Louison) and Clapet's daughter, Julie. Julie wants to save Louison's life so ventures into the sewers to seek help from a group of 'rebels' who live there (which again makes me wonder about the nature of the apocalyptic-style event). The rebels are known as Troglodistes and are, crucially, all vegetarian. The idea of Food 'n' Flix is to cook a dish inspired by the film. The plot of Delicatessen actually put me off cooking anything with meat so I wanted to think of something that the Troglodistes might eat. They forage off the land and live off pretty basic provisions - their reward for helping Julie is bags of corn. I decided that because the film is French, and onions are a cheap, basic staple that would have been probably one of the few things the Troglodistes can get hold of, I would make French onion soup. I've made this a few times before and this recipe is a combination of ones I have used before and me just making it up as I went along. This made one large serving or would serve two as a starter. Take four small onions, peel and slice into thin rings. Melt some butter in a pan and sweat the onions over a low heat until really soft - you can do this for as long as you like but I would say at least 30 minutes, up to 1 hour. When the onions are soft, pour the cider into the pan and add another 300ml of stock- either vegetable or beef. Bring to the boil then simmer for about half an hour so the stock has really thickened. If it's too thick, add a little more water or cider. I also added a dash of balsamic vinegar towards the end. I think generally French onion soup is served with pieces of crusty bread covered with melted cheese that sit on top of the soup, but I didn't think that would be true to the Food 'n' Flix idea as the Troglodistes wouldn't have cheese... and I wanted to keep this recipe simple. This month the Food 'n' Flix challenge is hosted by Elizabeth at the Law Student's Cookbook. I am also sending this to Credit Crunch Munch, the frugal food blog challenge created by Helen at Fuss Free Flavours and Camilla at Fab Food 4 All. This month the guest host is Janice at Farmersgirl Kitchen. This recipe is cheap to make in terms of both ingredients and energy, as it's all made in one pot. Soup sounds great, the film...not really my cup of tea! Thanks for entering Credit Crunch Munch. I love the route you took with this one! I decided to skip the mest this go-round, as well ;) You're soup looks delicious, I love French Onion!